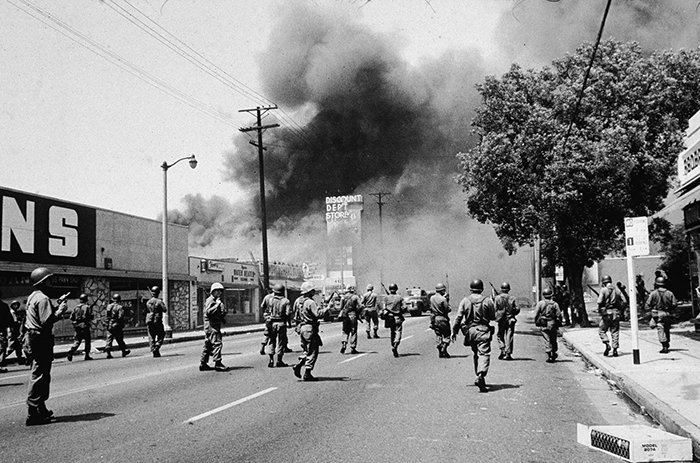 Watts erupted in rebellion against social conditions and police repression. 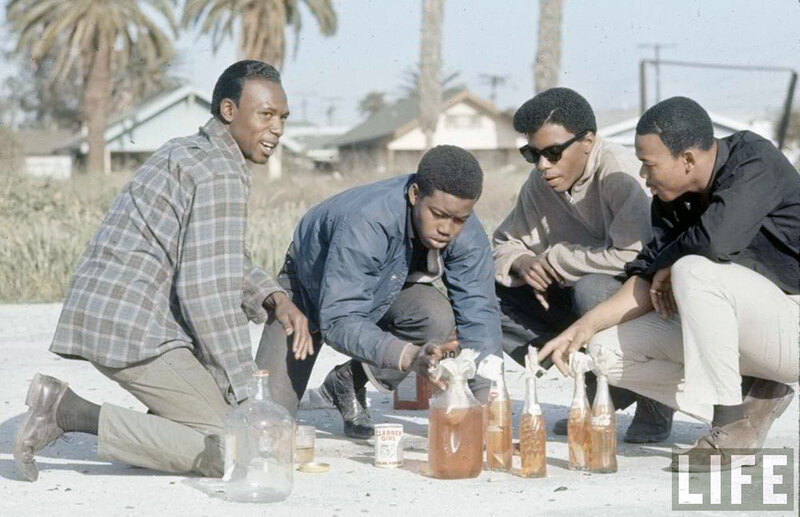 With the 40th anniversary of the Watts rebellion upon us, many still point to the arrests of Marquette, Rena and Ronald Frye as the embers that set Watts ablaze in 1965. On Aug. 11, the police pulled over Marquette’s car supposedly responding to reports of drunk driving. An altercation ensued, and a crowd quickly gathered as the police beat Marquette and his brother Ronald, before arresting them along with their mother Rena. Within 30 minutes of the arrests, hundreds of people were in the streets in mass protest. The Governor’s Commission, formed by then-California governor Edmond Brown, stated that the police were required to use “forceful action,” which, according to eyewitnesses, included the clubbing of onlookers. People remained in the streets throughout the night, marching throughout the area, demanding justice. How did a public protest that began on a small street corner engulf the Watts community for the next six days? The Frye arrests were only one factor that led to the mass outpouring of militant protest. Watts, at the time, was an overwhelmingly Black neighborhood in South Central Los Angeles. The Black community came out against the discrimination, violence and inequality that they experienced on a daily basis. For example, in 1965, eighth grade students in the Watts community scored in the lowest 15 percent nationally for reading comprehension. Archie W. Hardwicke, director of the Westminster Neighborhood Association, told the L.A. Times “in the Watts area 34 percent of adults were unemployed and 60 percent were on some sort of welfare aid.” (L.A. Times, August 1965) These are only a few of the causes that led to mass discontent in the Los Angeles area. During the rebellion, the state met the community’s protests with intense repression, including the imposition of curfews and the deployment of National Guard forces into South Central. The day after the first night of rebellion, various members of the Black community met with local police and city government officials in an attempt to temporarily resolve the situation. But instead of diffusing the energy in the area, the meeting compelled more people to demonstrate. The meeting turned into a candid discussion about the problems Black people face in the L.A. area. Community leaders proposed that all white officers be removed from Watts and the surrounding area, a request the city officials immediately denied. People continued to pour into the streets for the next two days. On the third straight day of rebellion, with thousands of people in the streets, the Los Angeles Chief of Police requested that the National Guard be sent into Watts. Over the next few days, with the National Guard at their side, the Los Angeles city government and police repressed the rebellion, carrying out mass arrests in South Central Los Angeles. In the repressive backlash of the state, 34 people were killed and over 1,000 were injured. The National Guard intervenes to suppress the rebellion. The Governor’s Commission predictably characterized the Watts rebellion as, “10,000 Negroes [taking] to the streets in marauding bands.” But the mass character of the rebellion was rooted in the national oppression of the Black population. Blacks throughout the United States faced police brutality and racism, and Watts was the transformation of collective anger and discontent stemming from that oppression into mass action. It came in the context of a growing mass Civil Rights movement, in which Black people across the country fought for long denied democratic rights. Unrest spread through Black communities nationwide, leading to demonstrations, sit-ins and pickets in Alabama, Mississippi and North Carolina. The movement also grew from the energy of the growing opposition to the Vietnam War, which called workers from all nationalities into a war for the ruling class. 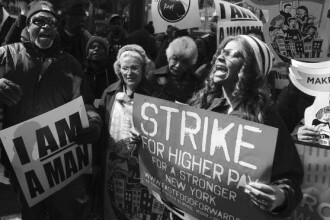 The United States was entering into a new period—a period of intense struggle against the continuous oppression of working and, particularly, Black people. The events in Watts introduced a new element into the struggle—the spontaneous action of the poor and oppressed, in its most elementary form. While some looting and vandalism did occur during the uprising, the events showed that through direct action, the ruling class would be forced to respond to the demands of the people. The Watts rebellion also laid bare the true nature of the police force. It exposed whose interests the government protects—the interests of the ruling class. The repressive, reactionary violence of the police could not be attributed to any single renegade police chief or one particularly racist police department. The National Guard helped the L.A. Police Department overtly brutalize the Black community. The moment the Black community rebelled and used force to change their economic and political situation, the government’s main priority was to maintain the existing, racist social order. For the ruling class, violent repression was an acceptable means to achieve that end. The rebellion was a sharp counterpoint to the nonviolence preached by more moderate sectors of the Civil Rights movement. Due to the scale and power of the Watts rebellion, more local and national attention was given to the problems facing L.A.’s Black community than ever before. While the non-violent movement received some attention, none of the progressive legislation, up to and including affirmative action, would have been enacted had it not been for the rebellions during the 1960s and 1970s. The violent character of the Watts rebellion terrified the ruling class. They were afraid that the rebellion would transform into widespread insurrection, and from insurrection to revolution. The Watts rebellion has lessons relevant to those who struggle against the ruling class. Once the latent revolutionary energy of the oppressed is unleashed, the movement can radicalize quickly. Largely because of Watts and subsequent rebellions, the Civil Rights movement transformed from a series of demonstrations and sit-ins into a full-scale national liberation struggle for Black people. Within a few days after the Watts rebellion, the Los Angeles city government made changes to temporarily improve the social conditions of the Black community and, they hoped, prevent future uprisings. In the decades after Watts, however, the dire poverty and massive police repression suffered by the Black community did not improve. These social conditions in Los Angeles led to another rebellion in April 1992, which was sparked by an outrageous jury verdict that found four police officers “not guilty” of viciously beating a Black man, Rodney King. The King beating was captured on videotape and seen by the whole nation. After the verdict, a fire of revolutionary protest overtook much of the southern part of the city. The angry rebellion once again forced the ruling class to call in the National Guard to repress the enraged Black and Latino communities. Such spontaneous outbursts are to be expected in a country with a social and economic system designed to super-exploit oppressed, particularly Black and Latino, communities. Over 200 such large and smaller scale rebellions have occurred reaching back to the days of slavery. 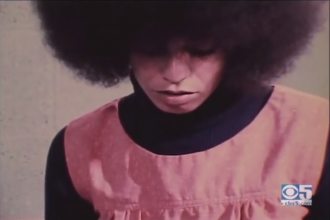 Forty years later, Watts stands out as an integral part of a revolutionary movement. 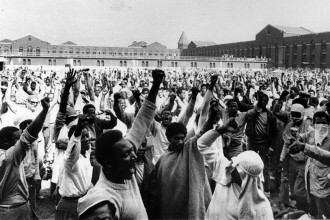 The struggles carried out in Watts and similar rebellions are part of the larger movement against class and national oppression. Uprisings like Watts, which display the revolutionary potential and rage of the oppressed masses, should always be supported by revolutionary and progressive people. While spontaneous uprisings are essential and take the struggle of the masses to a higher level, rebellion alone cannot bring about true and lasting liberation. This requires the workers and oppressed to be organized, and a battle-tested leadership capable of facing the ruling class. True liberation will not come until the capitalist system that oppresses us all is overthrown and destroyed. This is true in the United States as it has been in countries like Russia, China, Korea, Vietnam and Cuba before.